Do you celebrate Christmas in July? As a teenager we had some terrific neighbors that surprised us with a truck load of snow, a decorated tree and gifts on a warm summer evening. It was shorts, flip flops, snowballs, and wonderful memories. I can still recall what my gift was, it was a little wind up toy mouse. There is a story behind that too but that is best saved for another day! Thank goodness it is only July, but then again I’d better get cracking … Christmas in December is right around the corner! So it begins. Season’s Greetings! May is flying by! Dianne and I have a booth at the Prince Edward County Fibre Festival on May 27th. I suspect that having this on our calendar is part of the reason it is going by in a blink, yes my dear friends it is coming fast. There are lots of awesome vendors attending so if you are looking for a lovely drive and tons of fibre wonderfulness all under one roof you might enjoy taking it in. www.fibrefest.ca can provide more information. Please stop by and say hi if you can make it as we would love to see you. Today Dianne and I attended a social hosted by Christopher Walker www.cabinboyknits.com in Stirling, Ontario. 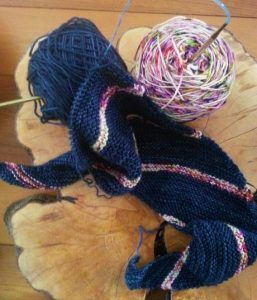 Cabinboyknits is presenting “Knitters in Residence” from May to October, 2017. On specific weekends there are a variety of scheduled workshops taught by 4 different teachers. Today we were given the opportunity to meet the faculty and see the location; I walked away wanting to take each class!!! The host, Christopher, and the instructors were very kind, inspiring and generous with their knowledge and time. The location is a beautiful wooded property with an authentic log cabin on it. What a combination, great people and stunning surroundings, … sign this girl up! As you can imagine the dye pots have been busy and will be busy for the next few weeks getting ready for the festival. Dianne has been exceptionally hard at it, she is the “have been busy” part of the previous sentence, I , on the other hand am the “and will be busy for the next few weeks” part. 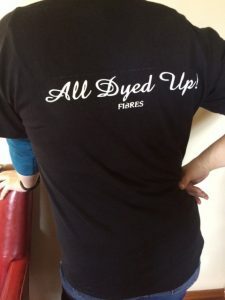 New for All Dyed Up! for the festival is our DK and worsted weight yarn and Dianne has produced lots of scrumptious colours! Just imagine all of the lovely things that could be made from these! 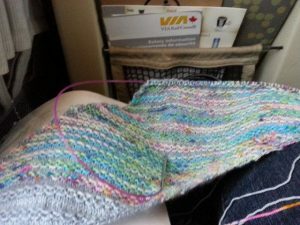 How do you hold your knitting needles when you knit? There are many different knitting styles as I understand it. Some styles have us hold the yarn in our left hand, others in our right, some have us throw the yarn over the needle, others have us “pick it”. I have read that we as knitters typically continue to knit in the style in which we are first taught. That sounds reasonable to me but having at least one other style under our belts can be quite handy. 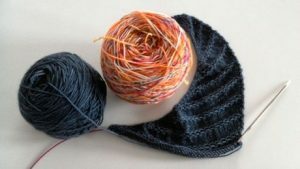 It can gain us some speed, help to alleviate hand strain, perhaps relieve a little boredom if we can jump back and forth between styles, and if we are knitting with two strands of yarn we can hold one in each hand instead of having to put one down and pick up the other with the same hand for each colour change. There are lots of resources online to help us learn a new style. This, dear friends, is where I find myself these days. 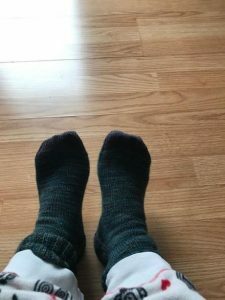 As with knitting styles there are lots of different needle choices and methods when knitting socks, double points, magic loop, 9” circulars, etc. I am typically a double pointed sock knitter but recently I dug a 9” circular out of my needle stash and thought I would give it a try again and lo and behold there it was, the reason the 9” was in the bottom of the needle stash, I hold my right hand needle like a pen and there is no room for that with a 9” circ. 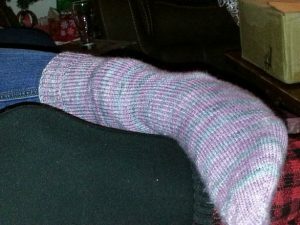 I would have to change what my right hand is doing as well as how I put my yarn around the left hand needle. 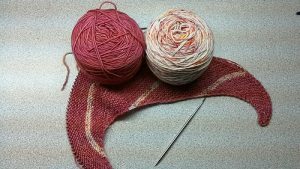 I think the process of knitting with the little circular could be faster, one essentially knits around and around therefore here is no switching of needles as with the double pointed sets. So it looks like I have a choice, struggle thru learning something new with my knitting or drop the little circular back into the dark hole! I say struggle because it will be a struggle not to flip back to my old tried and true method. Usually learning something new is a joy but aren’t they so much easier to learn if we don’t have an alternative method in our knowledge base that we like and are so comfortable with! How many days does it take to break a habit? Only time will tell which will prevail dear friends, will this old chick learn a new trick! Speaking of new, we have a new podcast out, episode three. Dianne and I introduced Gloria in this episode and as I understand it she will be a regular! We also mentioned how busy Dianne has been dying some new silk scarves. I think they are absolutely gorgeous, you might like to pop into the shop and take a peek, I bet you will agree with me. We really do smile, honestly we do. The yarn is very lovely, soft and just delightful! You tube selects the happiest pictures don’t they! I am full of smiles these days over a new project I am working on, once I get a few of the wrinkles worked out I will share it with you. I am a little excited about it! Until next time dear readers, whatever your style, all the best and thanks so much for stopping by. The holidays have come and gone and I can now share our Christmas secrets! Some of the special people in Dianne’s life received hand sewn bags and knitted socks. 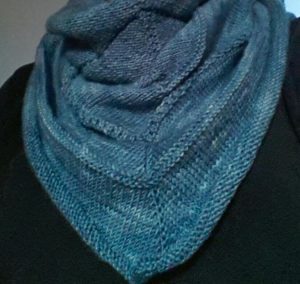 She also made a pretty blue shawl and a lot of hats! Her hats, all 50 of them, were donated to some wonderful folks. 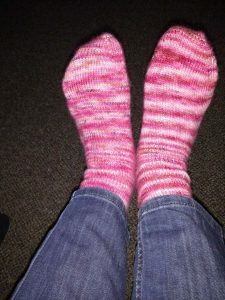 I knit socks and a hat but once again there isn’t a photo of the hat or one pair of socks. 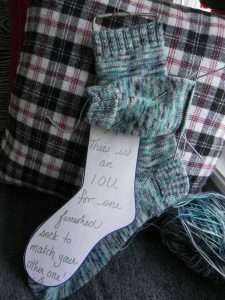 And true to form one present was given with an IOU for a matching sock! I tried to finish before wrapping time, really I did. 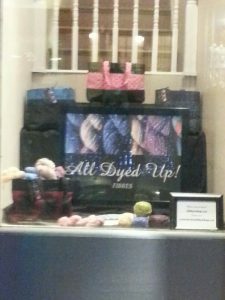 We knit both our own yarn and some from other dyers. 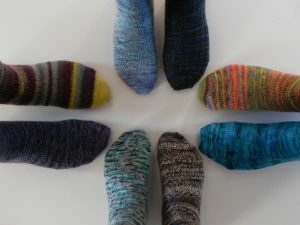 This past year Dianne and I visited some fibre festivals and had the joy of picking out some special skeins, we hit the dye pots and created some one of a kind skeins, and we had loved ones paint the yarn for their own socks. It was so much fun to see how they knit up. Christmas 2016 is behind us and the New Year has been rung in, I wonder what our Christmas 2017 handmade gifts will be, hhmmm! In light of my IOU habit perhaps I should get started! New experiences are the best aren’t they! Well, I guess it depends on the experience. 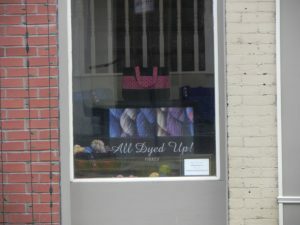 Last week Dianne and I had a fun one, we were graciously given the opportunity for All Dyed Up to display our items in a window on the main street of Napanee. 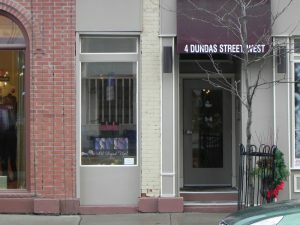 4 Dundas Street West if you would like to take a peek! 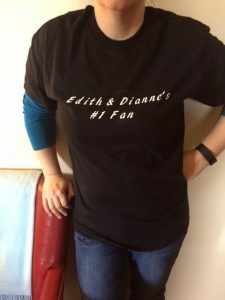 Dianne had a vision for the space. There is some yarn in front with a few of Dianne’s hand sewn bags up behind our sign. (Please pardon the window glare in all of the photos.) 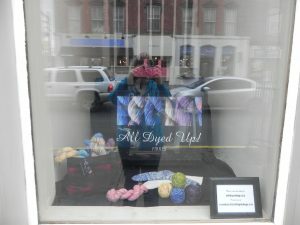 It was fun putting everything together to create the display, at one point I was crouched down in the window placing some yarn and Dianne said to me, “Edith look up, there are two ladies peering in the window.” Sure enough there were two ladies with their faces pressed to the glass checking out our display. Dianne said it was a good thing I was crouched over with my behind facing in rather than out!!! Yikes! Here I am (well my reflection) checking out our efforts. 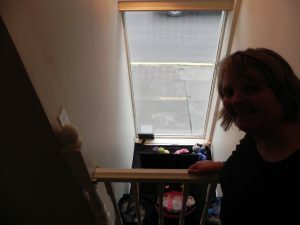 As you can imagine Dianne and I made quite a few trips pretending to casually stroll past the window to see what we thought of things. One of us would do the casual stroll down the sidewalk then dart into the building, communicate an adjustment to the other then back out to take another look. The whole time we didn’t put on a coat, (it is Canada in November) and we shared Dianne’s shoes because they are the slip on kind and much faster to put on than mine. We must have been a sight. 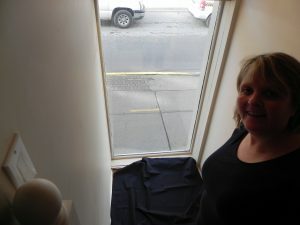 We can’t thank Rennie Hutzler enough for sharing her awesome window with us. We thank Rennie as well for providing us with a fun afternoon together, the indescribable feeling of seeing our creations in a display window, and the joy we got when we saw people taking a moment to look while going by. Thank you Rennie. You never know in this life what new experience is right around the corner, for us and All Dyed Up, this was a great one!